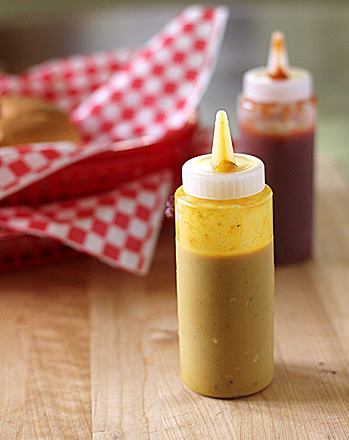 Here it is-- my version of South Carolina's mustard sauce for those of us who like a little kick with our barbecue. Most barbecue lovers will tell you that the meat and its smoke-infused flavor should be able to stand on its own. I have no argument with this opinion. I would guess, however, that most of us would like a bit of augmentation in the flavor department when sinking our teeth into juicy barbecued meats. This recipe is simple to prepare. It is slightly sweet with the right amount of heat. It is like flicking the nitro switch, but in a flavor drag race. It's the extra flavor that pushes your body back into the seat. Pour a bit of this liquid gold into your tank and let me know if you don't slap yourself silly. It is delicious with chicken, but it is made for pork. Having said that, who is ready for some pulled pork?! 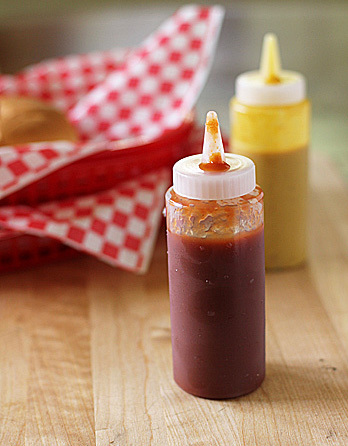 Mmm-- Carolina barbecue sauce! 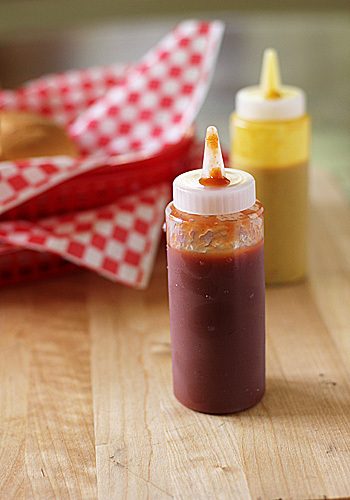 There are many regional sauces that taste great in their own special ways, but I was raised on this sweet, savory, smoky concoction and I place it right there at the top of the list. My first memories of it were when my grandparents would take us to the mountain town of Linville, North Carolina. There was a hole-in-the-wall storefront where we would stop for a chopped barbecue sandwich. I can still taste it. Then there is Henry's Smokehouse on Wade Hampton Blvd. in Greenville, South Carolina-- whole hog sandwich please! Unfortunately, I live far away from those smoky spots, so I have been forced (with great pleasure) to recreate those flavors. I make multiple batches of this sauce throughout the year. I use it during the warmer months, then freeze it to have on hand when it is no longer grill season. I like to use it on chicken and turkey. If every drop of this sauce had it's way, however, I'm sure it would want to go on some pulled pork. The recipe I am sharing calls for real smoke drippings, but you can certainly use liquid smoke instead. Just add to your taste. This sauce is so good, I eat it all by itself on toast. Note-- *If you are from the Carolinas, you can probably figure out what the yellow sauce in the background is, so stay tuned for another recipe. I had a little bit of rhubarb left in my garden for one more treat. It did not take long to settle on this pie. I made this years ago and haven't since for some reason, considering how incredibly tasty it was. 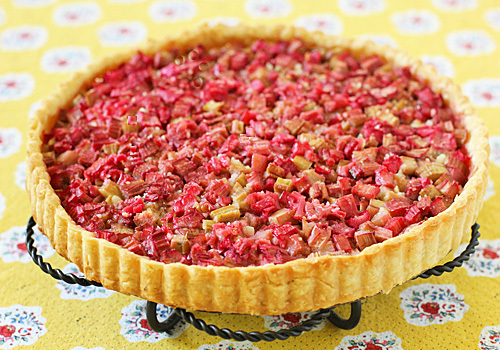 It is a rhubarb custard pie that is partially baked and then sprinkled with a crumb topping. The original recipe called for pecans and just a touch of coconut, but I omitted the pecans and upped the amount of coconut. Wow! Is this pie ever good! The custard is creamy and the topping has a crumbly, sugary crunch. We can't decide which way we enjoyed it more, after dinner while it was still warm with a scoop of ice cream, or the next morning with a cup of coffee. Either way it is delicious. The Fourth of July is right around the corner and many of us will be having picnics, barbecues, or grilling with family and friends. Looking ahead, I thought I would share with you my recipe for American Potato Salad. I loved my mother's potato salad as a kid. It was potatoes, eggs, mayonnaise, and mustard. No crunchy stuff and no green stuff. I have grown out of those childhood taste buds and texture issues and now I have to have a potato salad with a little bit of everything. I am, however, still particular about what goes in it. I like perfectly cooked potatoes-- not mushy. Once cooked, I season them with vinegar and chicken broth for added flavor. I use finely diced celery (because I don't care for big chunks) for some needed crunch. Bacon lends a smoky, salty taste. I also add finely diced gherkins for a pickled tang, along with chopped hard boiled eggs, scallions, and flat leaf parsley for more texture, flavor, and color. Lastly, I toss it all together with some of mayonnaise and a bit of Dijon mustard. Whew! 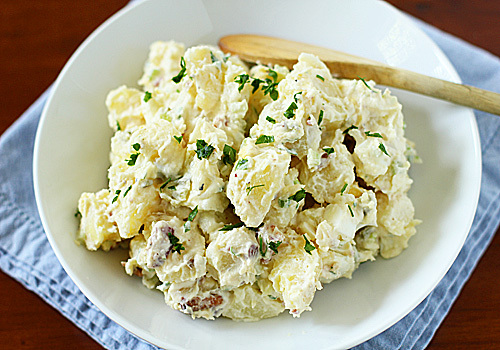 Now that's an American potato salad I can sink my teeth into-- creamy, tender, crunchy, and perfect! A while back, I shared with you my recipe for Ranch Dressing. 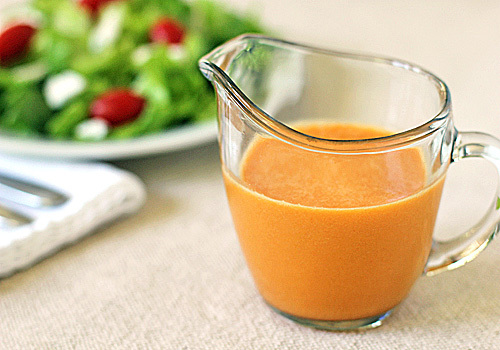 By adding a few more ingredients, the dressing takes on a whole new look and taste. Along with the dressing, I purée some roasted red bell pepper, which lends a sweet and smoky flavor. 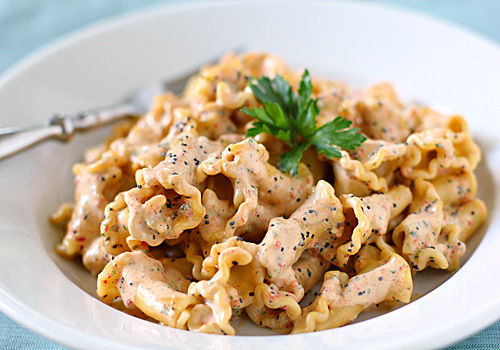 I stir in some poppy seeds for a nutty crunch, then toss it with pasta that has been drained, rinsed, and cooled. It is a tasty bowl indeed. It is important that the pasta is cooled completely. Adding the dressing to hot pasta will cause the pasta to soak up the dressing, leaving you with a dry salad. It is delicious as a side to grilled meats or with a lunch time sandwich. You can add diced chicken or turkey and chopped fresh vegetables, like tomatoes and red onion for a heartier main course meal. Growing up in a Southern family, fried chicken was a food group all by itself. I often wonder how many chickens my mother has fried over the years. Funny thing is, in my early childhood, I don't remember eating it hot-n-crispy, but do I ever have fond memories eating it cold for a picnic at the beach with potato salad, deviled eggs, and buttery pound cake. Mmm! When I fry chicken, I make sure I have enough to enjoy warm for dinner and then some cold for a picnic lunch-- just like Mom did it. 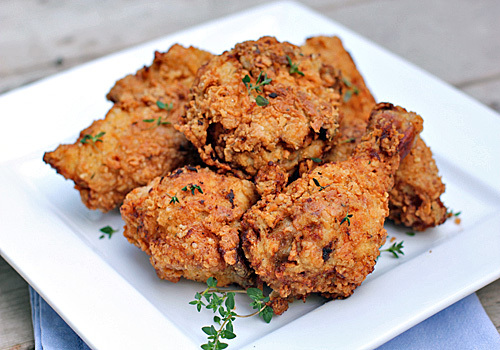 If you are new or intimidated to frying your own chicken, let me offer some helpful tips and tricks to ensure the juiciest, crispiest, and tastiest fried chicken. Soaking the chicken in a buttermilk marinade will help to produce juicy, tender meat. One of my most favorite parts of fried chicken is the crispy nubbins from the flour coating. To achieve maximum nubbinness (that's not a word), I drizzle a little buttermilk into the flour mixture to form small crumbs that will fry up crisp and crunchy-- a little trick my mom taught me years ago. I recommend using a cast iron pot or skillet to achieve that deep golden color and a oil thermometer to help maintain a proper temperature. I use vegetable shortening rather than oil because it gives the chicken a crisp crust without being greasy. Also, since shortening is more refined than oil, it doesn't leave an odor in the kitchen when frying. Lastly, I drain the fried chicken on a rack set over a baking sheet instead of paper towels. This ensures the crust will remain crunchy and not get soggy. 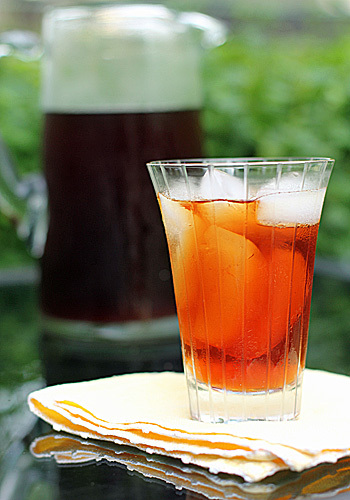 Whether you enjoy it hot, room temperature, or cold (with a drizzle of honey-yum! 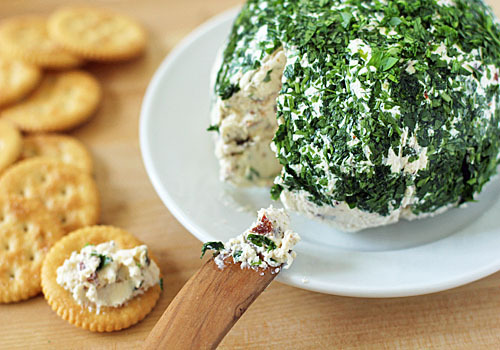 ), it is some down-home crunchy comfort food that will be sure to please. 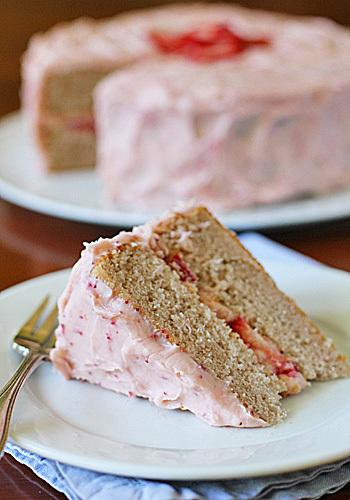 If you could take all the flavor of homemade strawberry ice cream and turn it into a cake, the end result would be this cake. It is a cake that tastes just as the name implies. Pink and dreamy. Fresh and frozen strawberries are used for maximum strawberry flavor. The frozen ones are pressed of their juice. The juice is then added to the batter and the pulp is added to the frosting. The fresh strawberries are sliced and sandwiched between the cake layers. 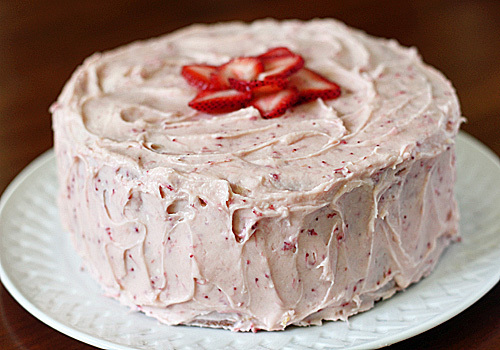 Then it is all frosted with a strawberry-cream cheese frosting that might have been the genesis for the phrase "to die for". 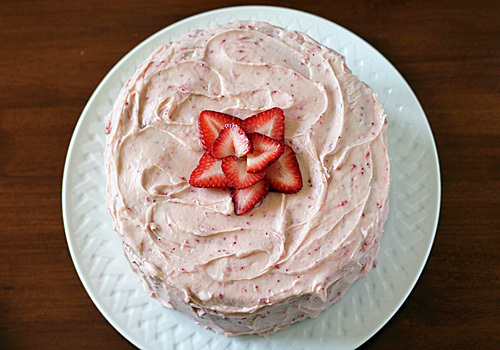 Before strawberry season gets away from you, please make this cake. Oh, drea-ea-ea-ea-eam, dream, dream, dream ♪♬. Can one have too many summer pasta salad recipes? They are perfect for my household because I can make a large batch for dinner, have leftovers for work, and some more to pack for picnics at the park or beach. Good, portable food in my house is a plus! 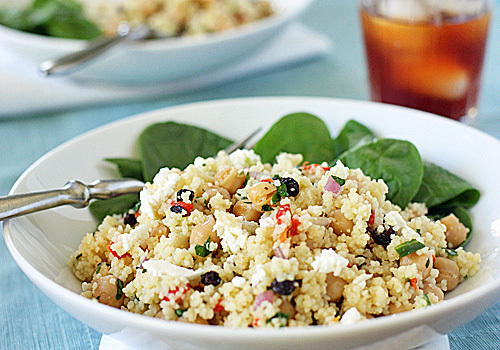 This is a classic deli pasta salad that feeds a crowd. The first time I made this, the five of us had a portion, some went back for another bite, and there still was over half left. I serve pasta salads with veggies and fresh fruit on the side so we don't mound our plates with just the pasta, therefore I increased the serving size to 8 adult servings. I made quite a few changes to the original, reducing the tuna and a few veggies, but adding chopped hard-boiled eggs (I love eggs) and fresh flavors like parsley and lemon. I also reduced the amount of sugar, but added a bit more mayonnaise to make for a tasty dressing. 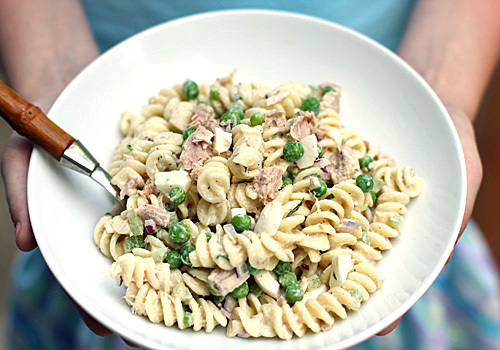 It is a delicious pasta salad that we all enjoy. Today is the last day hour of school. My children are off to pick up their report cards before quickly returning home in a little over an hour. These cookies are a great way to celebrate a great school year and, most importantly, great grades. 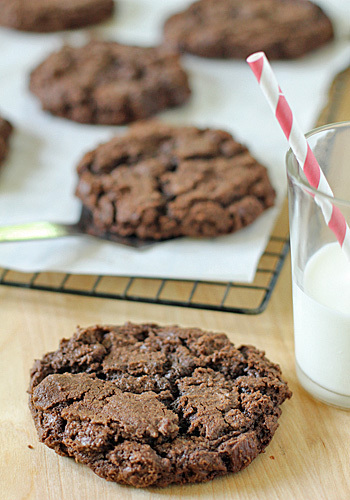 Mind you, these are no ordinary chocolate cookies with cocoa powder and a few chips. 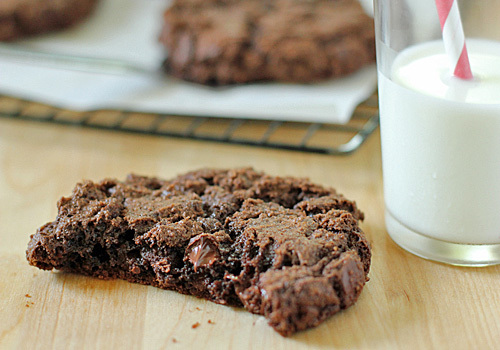 These cookies have a full pound of chocolate in just 12 cookies. Now that's a chocolate cookie! I use a mixture of milk and semi-sweet chocolate chips because that is my personal preference. I also use a good quality Dutch-processed cocoa and a bit of espresso powder for the best chocolate flavor. Another change that I made to this recipe was to chill the dough before baking. I like to refrigerate almost all my cookie dough for several reasons. When the butter is chilled the cookie spreads less in the oven. Letting the dough rest in the refrigerator also allows the gluten in the flour to relax, resulting in a soft, but at the same time crunchy cookie. Lastly, chilling the dough allows the flour to absorb more of the liquid in the dough, creating a better texture and deeper flavor. 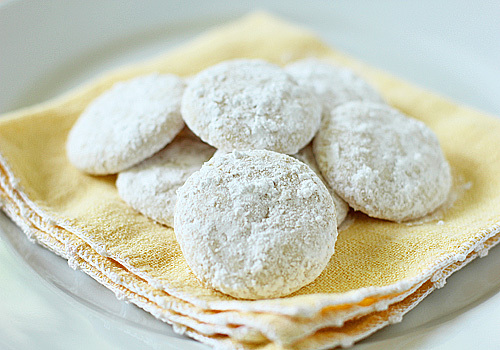 Speaking of texture and flavor-- the texture of these cookies when freshly baked is marvelous. When you bite into a cookie, the top cracks almost like an airy meringue and the inside is somewhere between a cookie and a brownie with gooey bits of chocolate. The flavor you ask?? Let's see-- chocolate, cocoa powder, butter, and sugar-- I don't think there is need of any convincing in that department. Just to make sure, maybe I should do a little "quality check". Yep, these 4-inch rounds of baked chocolate-ly goodness are stupendous! I was recently asked to create a custom recipe for babble.com. I jumped at the opportunity and immediately went to work. 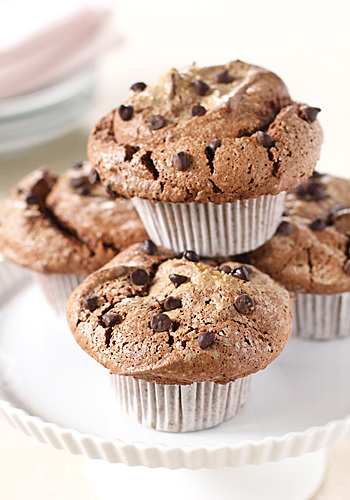 Instead of giving you the story behind the muffins, I will send you over here to read it. I will, however, leave you with the recipe only so I can document it for my blog and file it in my recipes. 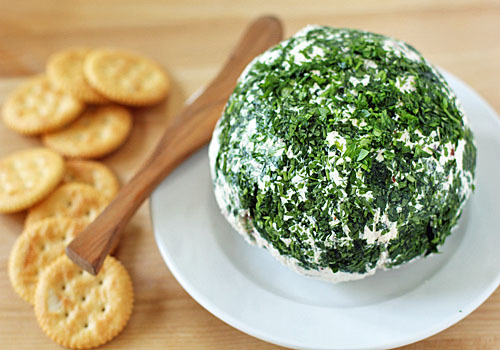 Don't forget to check out all the other 49 great recipes from Babble's Top 100 Mom Food Blogs. One quick note about the story behind the muffins... That favorite gourmet market and café in downtown Chicago that I love is Fox & Obel. Check it out if you get the chance! Once you start making certain things on your own, you never want go back to the store-bought brands. Pita bread is one of those things. Why?? One bite will tell you. 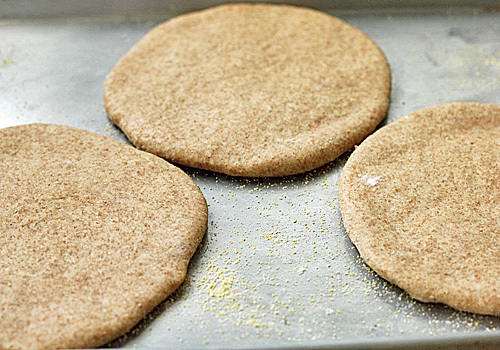 These pitas are soft rounds full of whole wheat flavor that are sweetened with a bit of honey. Don't be intimidated by making your own. They really are quite simple to make. 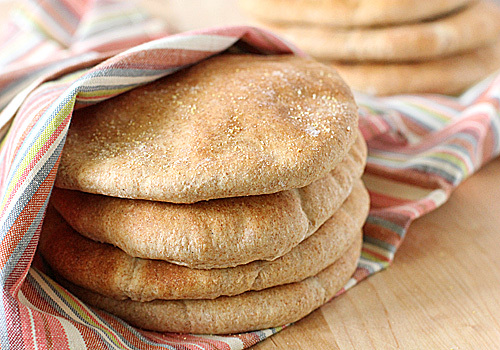 What I love about this recipe is the amount-- 12 pitas! That means some warm for dinner, a couple for pita pocket sandwiches for lunch, a few baked into pita chips, and whatever is left over goes into the freezer to help me out on a busy weeknight or for a last minute lunch idea. Below are a few step-by-step photos to help you with the process. 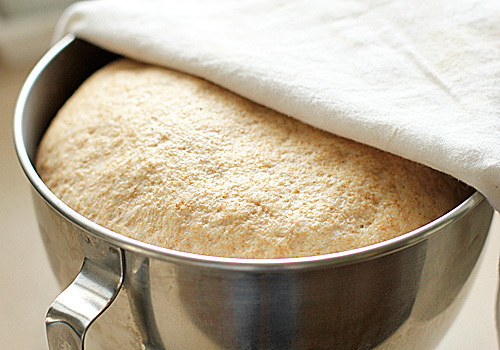 After kneading the dough, allow it to rise for one hour or until doubled in size. After the initial rise, gently deflate the dough. 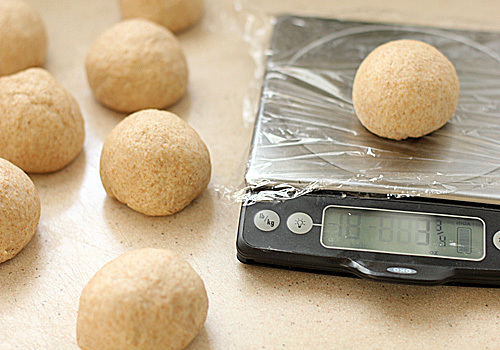 I like to use my kitchen scale covered in plastic wrap to weigh each dough ball, about 3 3/4 ounce each. I use a minimal amount (if any) of flour when rolling out the rounds. 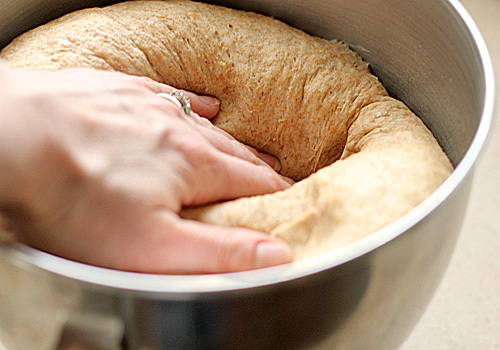 Too much flour will cause the dough to shrink back, making it difficult to hold the 7-inch round size circle. Also, when rolling out a round of dough, keep the other balls covered with a sheet of plastic wrap to prevent them from drying out. 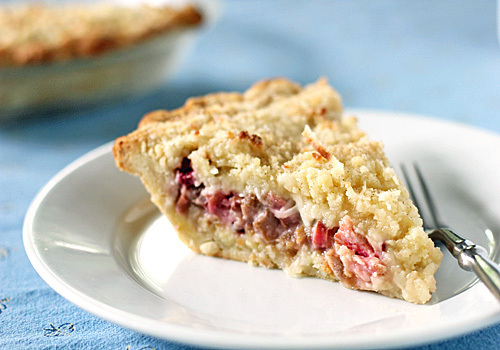 Lightly sprinkle the baking sheets with cornmeal to prevent the rounds from sticking. Allow them to rise for another hour (covered with a slightly damp kitchen towel) or until puffy, but not necessarily doubled in size. Then bake until lightly golden and puffy. 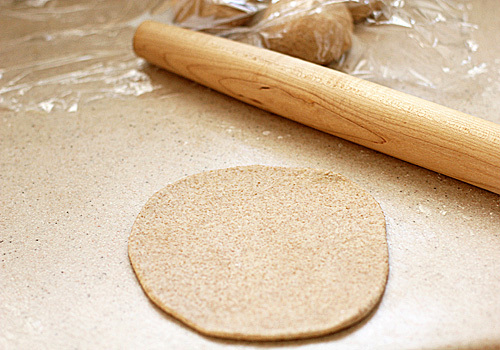 Mmm-- homemade whole wheat pita!